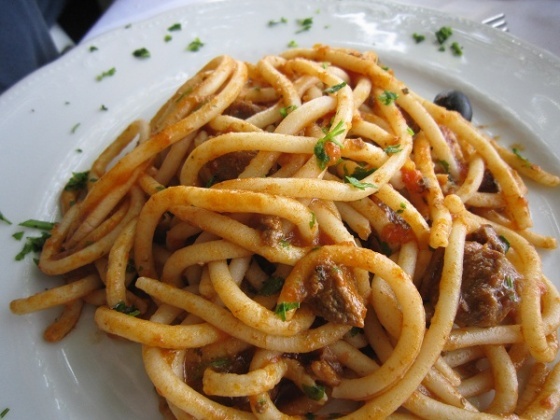 Pasta as we know it... but not in the 15th century. My father gently picked up a strand of the spaghetti I had cooked him and dangled it in the air over his plate. It quickly joined its tomato sauce-covered cousins below. I would’ve delivered this in the “tone” my parents were always warning me about. It might’ve earnt me a slap and perhaps I would’ve deserved it, but slap or no slap, it doesn’t change the truth. John Dickie, in Delizia! The Epic History of Italians and their Food, draws our attention to a few pasta recipes written by the eminent Maestro Martino de Rossi, sometimes called Martino di Milano and other times Martino di Como. We will call him Marty for short. Marty was a chef and the author of The Art of Cooking in around 1465 – a book generally considered important in the development of Italian gastronomy. What’s clear from this book is that Marty and his contemporaries liked their pasta soft, super soft in fact. The recommended cooking time for vermicelli is an hour and for macaroni two hours. Dickie points out that even if you take into consideration that Marty’s dough contained egg white and probably needed a little longer to cook than our pasta today, we’re still talking super mushy pasta. So see dad? You were wrong and I was right… even if it did take me 27 years to prove it. ← The fattest women in normal times?